For me the destination is not the highlight. It’s the journey. I have traveled a lot in my days. I have driven the highways and interstates across this great country criss-crossing dozens of times. I have been to every state except one, Hawaii and I am sure I will get there eventually. Heck, maybe for vacation next year. It is a big vacation destination for those living in the Great White North. So, where would I like to travel? 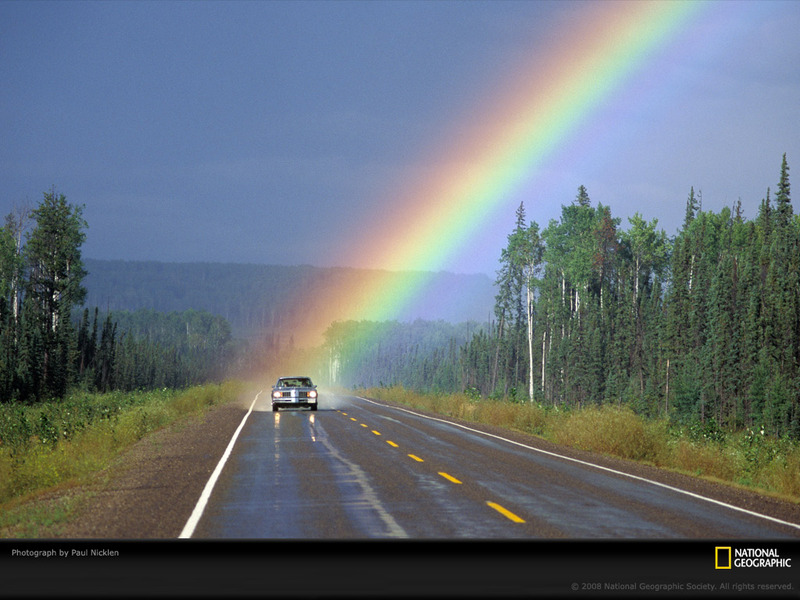 Somewhere over the rainbow is where I would like to go. In fact, I have a little story to tell. My family and I were moving from the Washington, DC area to Portland, Oregon when I was a senior in high school, I drove my 1984 Nissan Sentra. Things were great for the first, oh, 2400 miles or so, until we hit the great state of Utah. Hold on let me I digress a little bit–My mom, step-dad, and two bothers (Ryan and Chris) were traveling in the Family Truckster, a 1988 Oldsmobile station wagon–and I was in the Sentra. Before we left I outfitted the two cars with state of the art CB radio’s. Mine was a fancy Cobra model that even had a weather channel and an antenna about 15 feet tall. My parents just had the garden variety big box store weekly special. We gave each other handles before we left– My dad’s was Captain Mikey (he was a Captain in the Marines and his name was, well, Mike). My mom’s was Proud Momma, my brother’s was Cryin’ Ryan (referring to his younger days) and I was…. Yep, that’s right. I had the coolest CB handle of any 17 year old in America. Errrr… Did other teenagers even use CB radios? I don’t think so. I was under explicit instructions not to wander off and we were to remain in line of sight AND CB contact at all times. Like I said, things were cool until we got to Utah. Everything was copacetic until after lunch some times and then I saw it. It was a beautiful rainbow. I decided right then and there that I was going to follow that puppy to the end. Dad: This is Captain Mikey, First Born, you got your ears on? a little while later… Dad: First Born! Do you have your ears on! This is Captain Mikey! Me: No response, again and again. Finally I ran out of CB range I guess because I no longer heard the Captain. I tell you what I chased that rainbow for what seemed like 200 miles in every direction. I took highways, bi-ways, frontage roads, dirt roads, and off-roads. I never did find the end of the rainbow and it was getting dark. Knowing that we were in the great hands of AAA and their Trip Tik service all I had to do is make it to Ogden Utah to the Holiday Inn. That’s where we were staying. Under no circumstance what-so-ever did my family EVER deviate from the planned route and the hotel reservations made at least six months of Sunday’s before the trip. About 9:00 PM I rolled into Ogden. O-Town as I call it. And the entire city was a ghost town. Nothing was open. Not a McDonalds. Not a Burger King. Not a Pizza Hut. Heck, not even a Kentucky Fried Chicken. I alway thought the Colonel worked late. I guess not. I found the Holiday Inn. Back then they still had those huge green and yellow signs that you could probably see from space and I asked the lady at the front desk where our room was. They still gave that info out freely back then without even asking for your name, rank and serial number. I headed down the hall and opened the door. I got the look of fire and brimstone from my dad and luckily my mom and brothers were at the pool. Thank goodness I was too old to get spanked or it probably would have happened that night. The rest of the night was peaceful and I fell asleep on the roll-away bed. Not a word was said. Like clockwork the alarm went off at 5:30 AM. The rule was we always had to be on the road by 6. That never happened because my dad made it a point to always stay where they offered a free, sit down and order, breakfast. By 9 am we were on the road and I drove sheepishly behind the Olds for the next three states. I never wandered off again. What’s the point of this you may ask? Some day I will find the end of a rainbow. That is where I want to travel to. Not to meet little green men that have an obsession for yard weeds. Not to look for a pot of gold. Not to find Dorothy and the Tin Man. But to find where it leads. That’s what road trips and traveling are all about. Not Holiday Inn’s, nasty breakfasts, and CB radio’s. It’s about truck stop biscuits and gravy, cool road side attractions like Paul Bunyan’s anchor and the largest ball of twine. It’s about losing your wallet because you left it on the top of your car in the middle of nowhere Wyoming. It’s about side trips 500 miles out of your way. It’s about talking your wife into driving a thousand miles to meet you at an airport! That was part of the adventure! Thanks for checking out my blog and the comment! I’ll read yours too. That’s awesome that you have been to all of the states except for Hawaii. I think I have been to about half of them so far. I was a military brat. Our family got around!